The most disappointing thing about Justice League is how incredibly mediocre it is. It's not interestingly bad like Batman v Superman or great like Wonder Woman; it just sits there, apathetically going about its business so that everyone involved can get a paycheck. It doesn't do much very well and it does a lot wrong, but not so wrong as to render it painful to watch. Will it please people who just want to see a bunch of their favorite superheroes team up on screen to defeat a generic villain? Maybe. You will notice that Justice League differs a bit from the tone established in Batman v Superman. 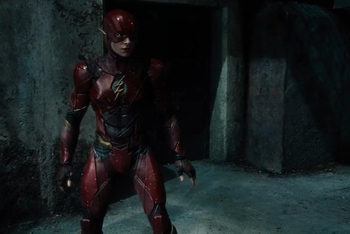 The reason for this, as many of you know, is likely going to be attributed to director Zack Snyder stepping away during post-production, Joss Whedon taking over, and several scenes subsequently being re-shot - with a lighter tone being one of the goals. What this means for the audience is that it doesn't fit as well with its direct predecessor (Wonder Woman kind of sits on an island to itself), and that it doesn't even gel properly within its own confines. It suffers from some tonal whiplash, sure, unable to marry its jokier moments with the more serious ones, but there's a bigger cohesion problem. Characters don't act the same from scene to scene. Relationships seem to grow and shrink depending on what the scene requires, not based on what's happened before. It feels like many of the reshoots were done to hurry things along in addition to lightening the tone. Something that should take 20 minutes to develop now takes 5, which comes too quickly for an audience to completely buy into. That means that, when Justice League tries to, essentially, introduce three new main heroes to the audience, it does so in an abbreviated way that doesn't really allow us to get to know much about them prior to them joining the League. I'd actually be far more interested in seeing a fleshed-out extended version of Justice League than the one we got of Batman v Superman. It could benefit from the extra running time - it's only two hours in its theatrical state. The story is paper-thin, as are most of the characters. "Here's a villain, here are some heroes, they fight twice" accounts for most of it. I don't want to spoil exactly who joins the fights, but if you've followed any of the coverage for the film prior to its release, you can probably get an idea of how it'll all turn out. I mean, Superman (Henry Cavill) is dead, after all, so he's totally out of the picture. 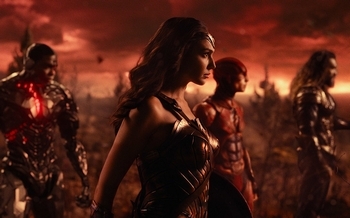 It's up to Batman (Ben Affleck), Wonder Woman (Gal Gadot), and a trio of newcomers to fight Steppenwolf (Ciaran Hinds), who is here to get three magical boxes and repurpose our planet as his own personal kingdom. Justice League feels like a trimmed-down, crowd-pleasing cut of a movie that probably wasn't great so it was edited into something that, at a minimum, was more tolerable. Steppenwolf is secondary, getting the most basic of motivations and only intermittently showing up. Ultimately, that's for the best; the special effects used to create him are not good. They make him look like a boss Orc from Shadow of Mordor, but his axe glows and he can jump really high. That would look fine in a video game but in a movie that costs this much it's substandard. There are a few other dodgy effects - and digital recoloring and retouching that looks just awful - but none that are as consistently as bad as this. It's not just the villain and the new heroes who feel like they've got a rushed and abbreviated time on screen. Many of the returning characters and new non-hero characters also feel this way. Amy Adams is in the film for a few scenes and her entire personality and arc is "I miss Superman." Batman gets a subplot about how he's getting older and can't be Batman forever but it gets almost no focus. Wonder Woman's arc sees her become more of a leader, which happens in a stilted, awkward, and forced way. Actors like J.K. Simmons and Amber Heard show up for a couple of scenes each, seemingly having bigger roles that were trimmed down into cameos. You can tell that these things had a greater focus at one point in the film's development; they barely remain in the movie we get to see. It doesn't have thematic depth - "let's be friends, maybe, at least for now" is about as good as it gets - and it doesn't get emotionally involved, either. It has nothing to it beyond jokes, exposition, and action. It's been cut down to its barest minimum so that we would accept it as a whole bunch of marginally entertaining nothingness. And so that it could play in theaters an extra time each day because if it's under two hours, it'll get another showing in when compared to something that's two and a half hours. And if that isn't a great example of how cynical this production is, well, I can't help you. Justice League feels like a trimmed-down, crowd-pleasing cut of a movie that probably wasn't great so it was edited into something that, at a minimum, was more tolerable. It is very uninteresting and unengaging in its current state. Characters have little to them, the plot is paper-thin, it's a mix-and-match of tones and shortens various conflicts to the point that they barely make sense to the audience - characters go against established traits in order to have an abbreviated conflict, for instance. Add in some dodgy special effects and you've got a movie that isn't very good. Is it bearable? Yeah. It's breezy and doesn't matter in the slightest. But it's watchable. Is that an improvement? I guess so. 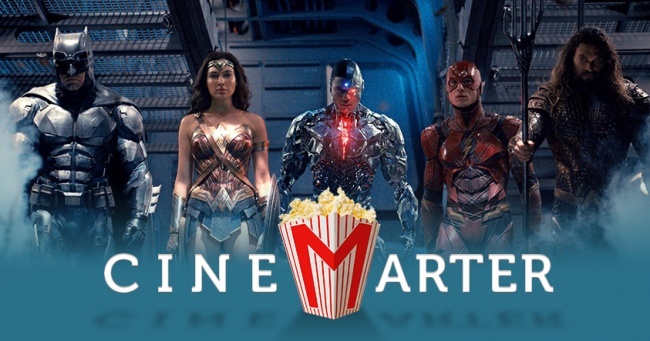 Bottom Line: Justice League is not a good movie but, if you're going to be subjected to it, at least it's breezy and short enough that it isn't painful. Recommendation: There's almost no reason to watch Justice League.